Synthetic Toys – HCI/AR/VR/UX & Wearable Computing – A site about augmented and virtual reality, wearable computers, nifty electronics and lots of opinions. 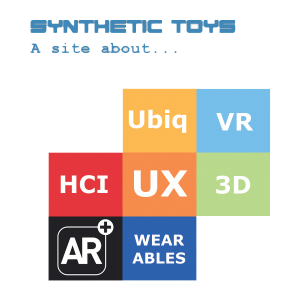 … to Synthetic Toys, a site about augmented and virtual reality, wearable computers, nifty electronics and lots of opinions. Synthetic Toys is above all an experiment. Or to be more precise a playground. A place to post our thoughts on various tech issues we spent time on. A few years ago we were members of the University’s of Essex Virtual Applications and Synthetic Environments (VASE) laboratory. Even today, while chatting over coffee or beer, we often think of those days as some of our most creative ones. This is our effort to revive the feeling of those days. Synthetic Toys is our virtual lab, a place to present our work up to now and to present our new efforts. AR as a field has moved miles since the early days and now receives quite a large amount of publicity. Trying to remember how things were about a decade ago and what where our predictions at the time, regarding today – the ‘future’ back then – we’d say the time to work on AR has never been better. And it seems we are not the only one believing this as many AR applications are cropping up around us and people seem engaged to the subject like never before. So, as we try to overcome our nostalgia for university days, as we miss those opportunities we left behind and as we are trying to find new ways to explore AR, we will be collecting as much information as possible. We will try to offer comments and views on this information and sincerely hope you will find our posts both informative and enjoyable. So, see you out there!